This popular flower, the orchid demonstrates a delicate and feminine appeal. The orchids are meticulously rendered by Cartier's skillful craftsmanship with the finest precious materials. Crafted in 18k rose gold with pink sapphires and diamonds the orchid is now a classic motif in Cartier jewelry. Just precious!!! 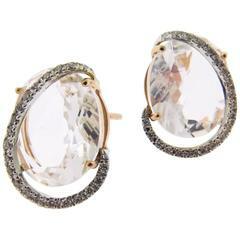 This is an amazing combination of stones, natural quartz and surrounded by round white diamonds set in 18k rose gold. Just precious!! !